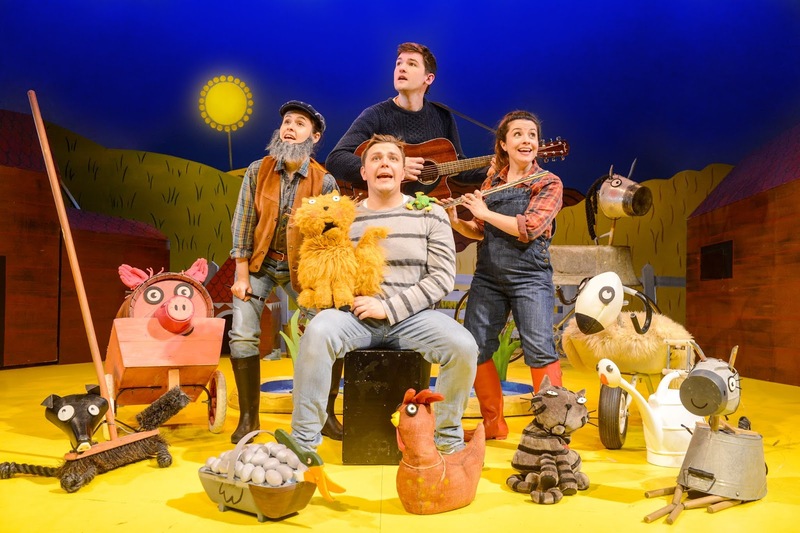 When Culturebaby was really young, one of the first pieces of childrens' theatre we went to see was the stage production of What the Ladybird Heard based on the modern classic by Julia Donaldson and illustrated by Lydia Monks. It was therefore particularly lovely to revisit this all singing, dancing, rhyming celebration of brilliant writing for children. The energetic cast of just four brings the book to life splendidly with catchy tunes, musical instruments and clever puppetry. Here we join a farmer and his yard of creatively crafted animals, including a prized cow who is frankly rather pleased with her own credentials. 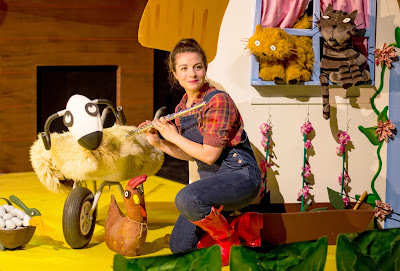 Using items from around the farm, the cast cleverly brings a host of animals to life. 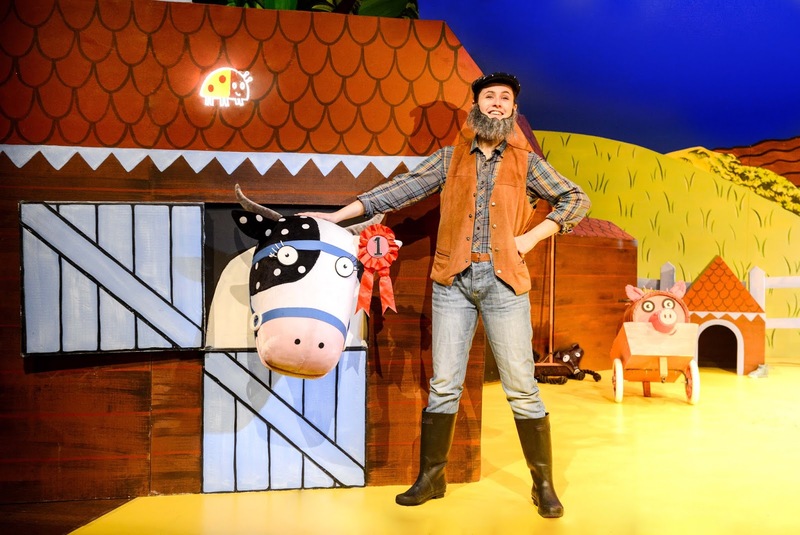 A horse emerges from a bath and a bike, a sheep from handlebars and a rug, a hog from a barrel and cart, a dog from a brush... Farmhands and theatre stewards double up as the crooks Hefty Hugh and Lanky Len who are determined to steal the farmer's prize cow and retire on the proceeds. "Once upon a farm lived a fat red hen, a duck in a pond and a goose in a pen, a woolly sheep, a hairy hog, a handsome horse and a dainty dog, a cat that miaowed and a cat that purred, a fine prize cow... and a ladybird. And the cow said, ‘MOO!’, and the hen said ‘CLUCK!’, ‘HISS!’ said the goose and ‘QUACK’ said the duck. ‘NEIGH!’ said the horse. ‘OINK!’ said the hog. “BAA!” said the sheep and “WOOF!” said the dog. One cat miaowed whilst the other one purred… And the ladybird said never a word." Hugh and Len plan their great robbery meticulously - planning to follow the sound of the animals as they creep around in the dead of night - but with the help of an extremely talented ladybird, the animals are determined to protect their friend and foil the thieves' plan. Julia Donaldson herself describes What the Ladybird Heard as one of her favourites amongst all the books she has written (she has since produced sequels including What the Ladybird Heard Next and What the Ladybird Heard on Holiday). She notes: "The germ of the idea was born when my youngest son, Jerry, had just started primary school and couldn't read yet fluently. The teacher asked the class to match up some animal words with their sounds. In Jerry's case the result was quite comical: a hen hisses, a dog moos, and so on. I couldn't help laughing (though not in front of my son) when I saw his piece of work, but I had no idea that many years later it would inspire me to write What the Ladybird Heard." Donaldson has said how wonderful it is to see her characters come to life on stage and illustrator Lydia Monks has been involved in the development of the live show - which certainly captures the essence of her adorable illustrations. The challenge was to stray true to the short story, whilst extending it to an hour of theatre. The songs and audience participation achieve this in a seemingly effortless manner and the jolly cast managed to get everyone up dancing by the coda. 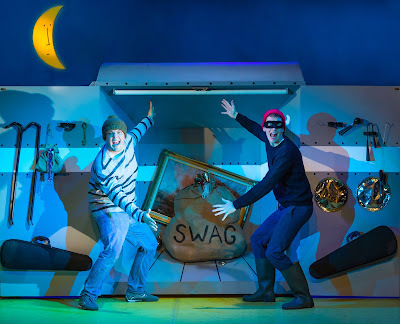 When we posted about our trip to see the show this half term at the wonderful Rose Theatre in Kingston, so many of our friends who have seen it agreed what a fantasic production it is. 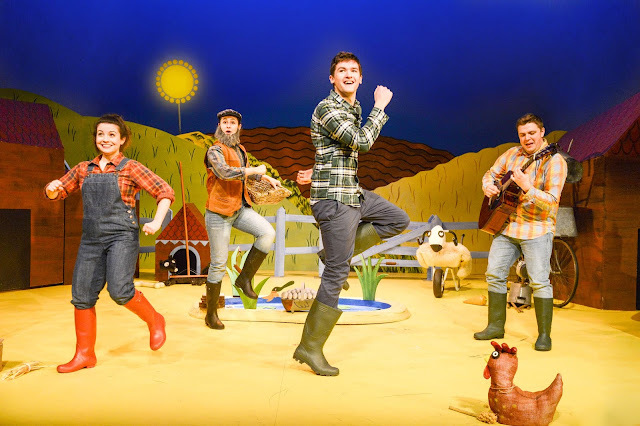 There are performances tomorrow in Kingston and then Ladybird will be touring the country. You can find a performance near you here. "At the dead of night the two bad men (Hefty Hugh and Lanky Len) opened the gate while the farmer slept and tiptoe into the farm they crept. Then the goose said, “NEIGH!” with all her might. And Len said, “That’s the horse — turn right." And the dainty dog began to QUACK. “The duck!” said Hugh. “We’re right on track.” "OINK,” said the cats. “There goes the hog! Be careful not to wake the dog.” “BAA BAA BAA,” said the fat red hen. “The sheep! We’re nearly there,” said Len. Then the duck on the pond said, “MOO MOO MOO!” “Two more steps to go!” said Hugh. And they both stepped into the duck pond — SPLOSH!" Disclaimer: We received tickets to the performance for the purposes of review. As always all views are very much our own. Images and quotes courtesy of the Rose Theatre Kingston and Ladybird Live. 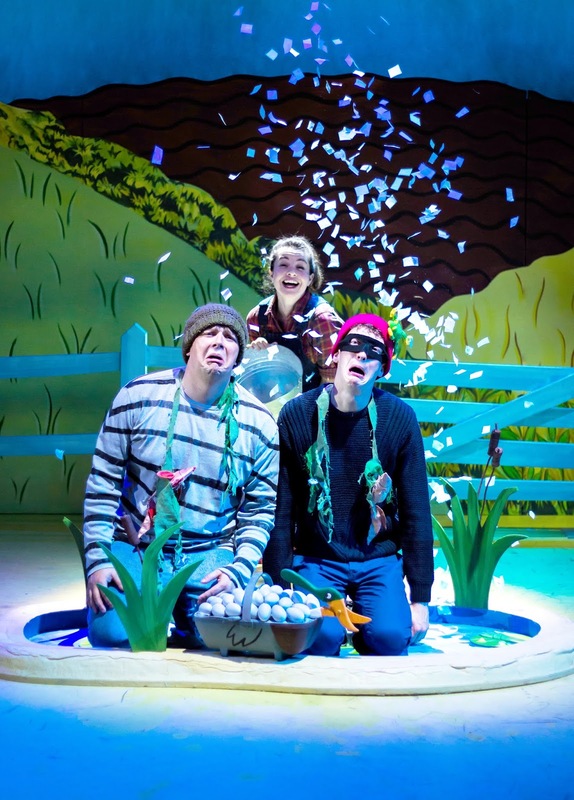 For more great family programming at the Rose Theatre see their website here. For more Donaldson, the Gruffalo's Child will be playing in October.